Elderberries are a somewhat bitter blue-black fruit produced by a group of shrubs in the Sambucus genus, relatives of the honeysuckle. Dozens of different species grow in the wild across most of North America, but the species most commonly sold as a landscape plant is Sambucus canadensis, the North American black elderberry. Elderberry fruit is not commonly sold in grocery stores because of low demand, but if you are lucky enough to live in an area where elderberry grows wild, or if you have a shrub in your landscape or know someone who does, there are a variety of wonderful wines, juices, jams, and jellies you can make from this plucky little berry. If you are harvesting wild elderberries, make sure to do your research. The edible quality of elderberries varies by species, so consult with local experts for recommendations on which elderberries are best for forage-gathering. 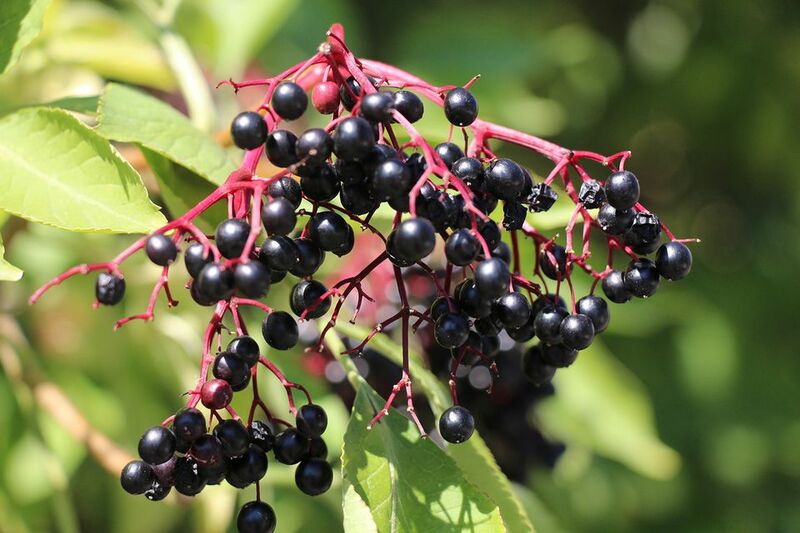 The fruit of the North American black elderberry is excellent for a variety of uses; it can be found growing wild in many areas, as well as in landscapes. Warning: Some species of elderberry are toxic until they are ripe, so if you are harvesting berries, make sure to do your research and harvest them only after the berries are plump, slightly soft to the touch, and fully darkened. 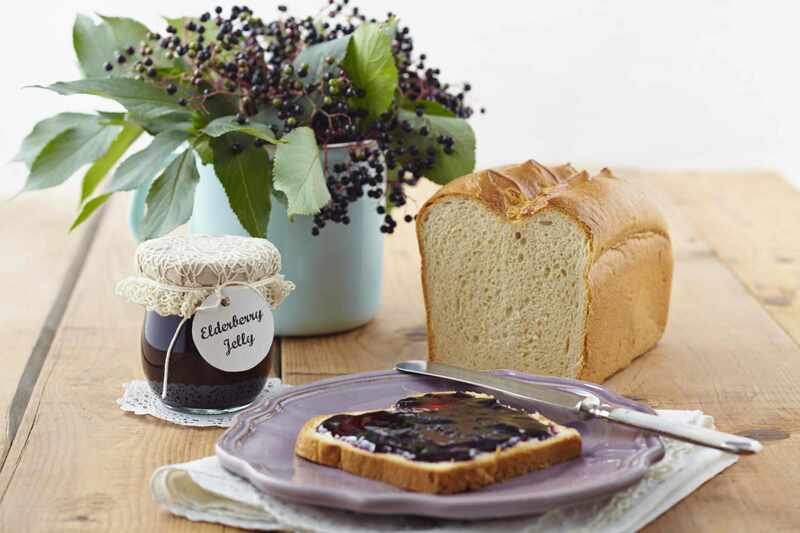 Making jelly is a great way to introduce elderberry to your family. Making elderberry jelly from a simple mixture of elderberry juice and sugar is a great way for your kids to learn about wildcrafting and self-sufficiency. Since jellies can be canned in a simple hot water bath, they are a great beginning recipe for anyone who wants to explore the art of canning without learning the art of pressure-canning. Keep on the lookout for elderberries as they come into bloom. You might be surprised at how small the berries are. It takes a large bowlful to make enough juice for a batch of jelly. Elderberry jelly can also be melted down to create a glaze between the layers of a cake. You can use it warmed by poking holes in a single layer vanilla cake and pouring a jar of melted jelly over the cake. Sweetly effervescent, what's not to love about elderflower fizz? Even the name evokes a sense of fun. Elderberry flowers are beautifully fragrant. They are prolific for a short period of time, so be on the lookout in order to harvest them during the peak period. Remember, leave enough flowers on the bush so that berries can form later in the season. Pick flowers from the heaviest laden bushes, and even then only take about 25 percent, leaving half of the flowers for the wildlife and another 25 percent for later berry harvest. Since not every year is a big one for elderberries, it is prudent to not over-harvest the flowers. The flowers can be used to flavor a variety of fizz recipes, such as elderberry champagne. A variety of recipes are available can turn elderberries into delicious wine with only about six months of fermentation. Elderberry wines tend to be a bit tart, but quite dry and delicious, especially when allowed to age beyond the six-month minimum fermentation period. Make elderberry syrup by the quart, and keep it on hand for the entire year. Keep it in the back of the refrigerator, for those times you want to make cough drops or even lollipops. Freeze the syrup and store it until you need it. Elderberry syrup is wonderful for flavoring teas and herbal remedies for children. Use it in ice pops and, of course, over ice cream. You can never have too much of this delectable treat. What's not to love about homemade pie? Elderberry pie is a nostalgic classic, harkening back to the old-fashioned pies that grandma once made. Why not harvest as many elderberries as you can this year, and stash them in the freezer to make pie all winter? In many regions, wild elderberries are virtually free for the taking. For a nice change, try making hand pies for tucking into lunch boxes, or keep them on hand for whenever those cravings for sweets arise. Elderberry hand pies will put most packaged snacks to shame. Elderberry has a long history as a folk remedy. An excellent "adults-only" tincture can be made from steeping mashed elderberries in vodka or another spirit, then straining it. The resulting tincture is said to be good medicine for colds or digestive ailments—not to mention its benefit as a nighttime cordial. The best elderberries for medicinal tinctures are black elderberry (Sambucus nigra) and American black elderberry (Sambucus canadensis).